Thoroughly revised and updated, this widely acclaimed reference/text is both an ideal teaching source and a succinct working manual for organizing effective quality-reliability programs in any industrial plant. Its purpose is to achieve practicality within a framework of prevailing technology. Provides cost-effective statistical methods and procedures. Includes sampling plans, control charts, and special information on tolerance build-up, randomization, and process improvement through planned experimentation. Includes review questions, problems, and minicases. Inspection and Testing for Quality Control. Installing Lot-by-Lot Inspection. Basis of Sampling Plans. Process Inspection and Control Charts. Control of Variability. Statistical Basis of Control Charts. Further Control Charts. 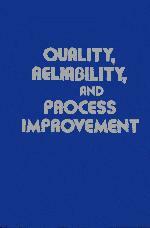 Process Capability and Product Tolerances. Vendor-Vendee Relations. Organizational Aspects. Installing Quality Control. Analysis of Variance. Optimizing Processing Through Evolutionary Operation. Statistical Build-up of Tolerances. Multiple Tolerance Chains. Reliability Assurance. Reliability Design. Process Improvement. Appendices. Index.